17 And after six days Jesus took with him Peter and James, and John his brother, and led them up a high mountain by themselves. 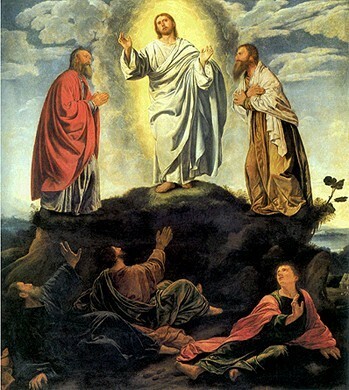 2 And he was transfigured before them, and his face shone like the sun, and his clothes became white as light. 3 And behold, there appeared to them Moses and Elijah, talking with him.4 And Peter said to Jesus, “Lord, it is good that we are here. If you wish, I will make three tents here, one for you and one for Moses and one for Elijah.” 5 He was still speaking when, behold, a bright cloud overshadowed them, and a voice from the cloud said, “This is my beloved Son,[a] with whom I am well pleased; listen to him.” 6 When the disciples heard this, they fell on their faces and were terrified. 7 But Jesus came and touched them, saying, “Rise, and have no fear.” 8 And when they lifted up their eyes, they saw no one but Jesus only.